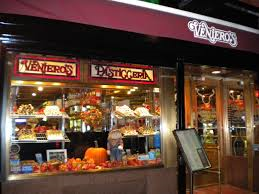 Veniero’s is a New York City institution and for those who really know Italian pastry, it’s the best bakery in the city. Founded in 1894 by Antonio Veniero, the bakery started as a pool hall and café where Antonio would serve patrons his baked goods. When his pastries started winning awards left and right, they became the focal point of the business. Veniero’s is 120 years old and to this day is still run by the family. It’s been featured on episodes of Law & Order as well as Curb Your Enthusiasm and was likely frequented by every major Italian gangster that passed through New York City, not to mention the locals. If the walls in Veniero’s could talk I bet they’d have some great stories to tell. Even with all its history, it’s the pastries at Veniero’s that keep the customers coming back for more. When I’m in an Italian bakery the first thing I try is the cannoli. If it’s good we can talk, if they can’t get that right then I’m gone. The cannoli at Veniero’s is a work of art. The shell is crunchy and the cream is the perfect consistency, not too dense, smooth and not grainy at all, it’s truly magnificent. For those not fortunate enough to live within driving distance of this gem of a bakery, you can buy a cannoli kit straight from Veniero’s website at www.venierospastry.com. You get 12 cannoli for only $34 bucks and to be honest they’re a bargain at any price. If you’re from Nebraska and you serve these at your next dinner party, you’ll be the talk of the town for a year. Veniero’s is also famous for its almond torte also known as a Torta Di Mandorle which is baked marzipan over a yellow sponge cake and layered with apricot jam filling, marinated in light rum and then glazed with apricoating. Veniero’s is full of Italian desserts including Italian butter cookies, macaroons, millefoligie, Napoleon, pignoli, rainbow cookies, sfofliatelle, spumenti, tiramisu, biscotti and fruitti di Bosco. That just a few of many and they’re all top notch. The cheesecake is also fantastic and comes in several flavors and with different toppings to satisfy and palate. The cakes are no different and I strongly recommend the Black Forest and the tiramisu and I’m not recommending one or the other, I’m saying both. They are both equally amazing and appeal to different tastes. Veniero’s is family run so they also make custom cakes for every occasion from birthday to wedding. Basically, it gets no better than Veniero’s and in my opinion that’s not limited just to New York City. If you’re anywhere in the tri-state are I’d say it’s well worth the trip. If you’re planning to pick up some of these freshly made desserts for the holidays make sure you have some time to spare or you go a day early because everybody in New York City who knows a good cannoli will likely already be there.